The Daffodil (Narcissus) brings an over the top burst of golden yellow to brighten up our day and mood! There is something about that warming burst of yellow after the winter grey/brown doldrums that will always make Narcissi a perennial favorite of so many. It’s an easy flower to grow from bulbs and they naturalize so well with so little effort. They also have the additional benefit of a lovely sweet scent! 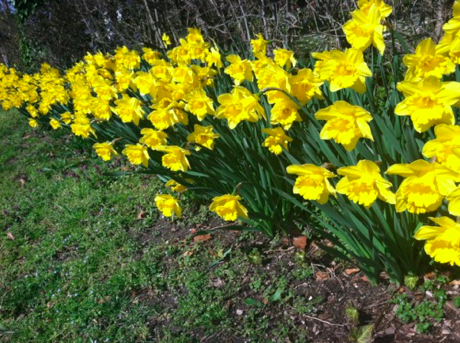 The high levels of alkaloid poison, lycorine, found in the bulbs and leaves makes Daffodils unattractive to the squirrel, skunk, mole and deer – another bonus that makes them a spring garden necessity . The history of the Latin name for Daffodil stems from the myth of a beautiful youth named Narcissus, who upon looking into a pond fell so in love with his reflection that he would not leave it to eat or drink. As the story goes, the gods took pity upon him and transformed him into a flower whose yellow head looks down to always feast upon it’s reflection!. You can remember this tale every time you use the word “narcissist.” Bottom line, they are gorgeous and supremely mood up-lifting.